I wanted to try making Soon Kueh again with a different recipe for the dough, plus, I also had leftover turnip in the fridge. The last (or first) time I made it, I used rice flour, tapioca starch and oil. This time I found a recipe on Lifestyle Food which uses wheat starch flour (dung meen fun) instead of rice flour. 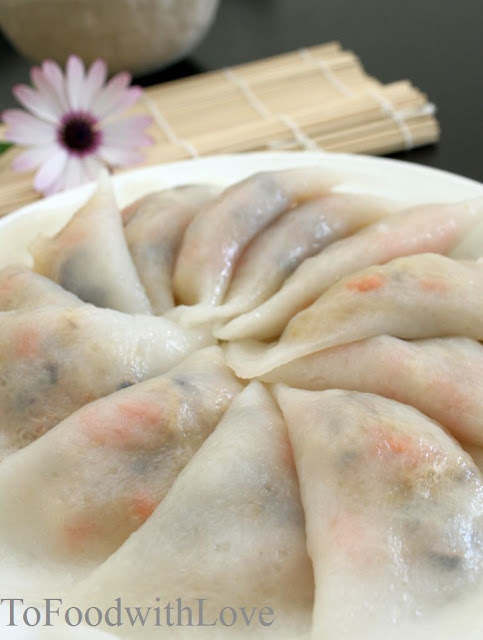 I wanted the skin to be similar to that of Har Gow (prawn dumplings) found at Dim Sum restaurants, translucent with a springy texture, and wheat starch flour does the job. I was happy with the way the dumplings turned out. They were chewy and springy with just enough bite, and eaten with crispy prawn chilli and my trusty friend, ABC chilli sauce, it's yum! Mix wheat starch flour and tapioca flour in a large mixing bowl. Add boiling water and mix thoroughly using a plastic rice cooker server or plastic dough scraper till you get a translucent like dough. Cover with cling wrap and let it rest for 10 minutes. Add oil gradually and knead into a smooth dough. Roll out dough into a long sausage roll and divide into about 15 pieces for wrapping the dumplings. yummy i want some more! Hi Anonymous, it's wheat starch, NOT wheat flour. Totally different.